As we entered the Church of St Addai, the full hatred for the “followers of the Cross” was revealed. The Islamists had attempted to burn the church. A smashed statue of Our Lady was on the ground. The altar had bullet holes in it. Everywhere – in that church and the others we visited – the Cross was defaced, destroyed or in some way vandalised. Even if a wooden door had a Cross on it, at least one arm would be broken. [..] All across the Nineveh Plains, the home of Christians for almost 2,000 years, the same thing has happened: Islamists cannot bear the imagery of the Cross. Suddenly, Steve Rasche, an American who works for the Archdiocese of Erbil and was coordinating our visit, knelt in the rubble and picked up a Cross. Brushing off the rubble and dirt, he saw it was unbroken – the corpus had been removed, but the Cross was intact. 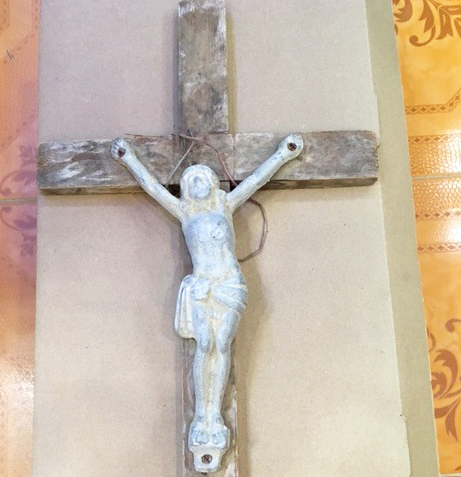 Then Rasche, whom I later christened “the Crossfinder”, told us the story of the miraculous Cross of Baqofah – which ended up on display during the weeks of Lent in, of all places, Westminster Cathedral. areas that no longer fared as well as that crucifix. In the city of Saidnaya, a mere 17 km north of Damascus, we enjoyed the hospitality of the the Orthodox sisters at Our Lady of Saidnaya Monastery, one of the oldest monasteries in the world. We participated in Lenten Friday evening services, roomed overnight in the rooftop quarters for guests and gazed out at night in a city where Christianity and Islam coexisted peacefully. The monastery has been badly damaged during the six year Syrian conflict, and, with the fall of a stable government, Christians and Muslims no longer share this magnificent resource, where an icon of Mary, attributed to St. Luke, was reverenced daily by both Christian and Muslim pilgrims. Is all lost? Hard to know, but in prayer, I find that the echoes of that time still move my heart and soul to consider how we must, more than ever, treasure our traditions, our heritage… our faith. 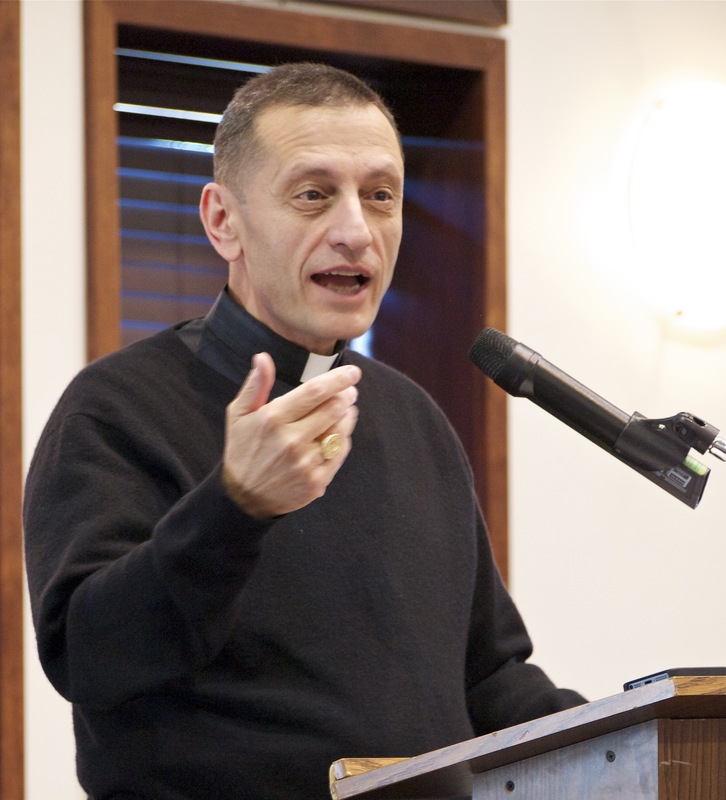 In the run-up to this year’s Clergy Convocation at the Edgewood Resort and Conference Center in Alexandria Bay, NY, I was considering the title of Bishop Caggiano’s presentation: “We Are Called to Joyfully Proclaim the Cross of Jesus Christ”. Recalling an encounter with another presentation on the Cross at the Oblate Seminary and College in San Antonio, TX, I was moved by Richard Rohr’s insightful lecture on the contradiction of the Cross and left to wondering if another presentation on the Cross of Christ Jesus was indeed something I needed. How wrong I was! Providing ample time for dialogue as well as thoughtful reflection, Bishop Caggiano presented concise, insightful and actionable comments on our call “to be covered by the dust of the rabbi’s sandals… called by sure grace… sure and uncertain love, to receive the gift of joy“. With the Bishop’s permission, I have attached a 2-page pdf with my notes of his presentation. They are in no way complete or authoritative, and they miss the richness of his address punctuated by personal anecdotes and meaningful side notes from Mother Theresa, Pope Francis and others. My hope is that in some small way, our fellow laborers in the vineyard will have cause to reconsider our mission, as Bishop Caggiano framed it, and to embrace the Cross, seeing in Jesus Christ’s extended arms an embrace for all humanity in unconditional love, and from his crown of thorns to the pierced feet an unbroken line between God and man uniting heaven and earth… reestablishing the kingdom.